"The Hunger Games meets The X-Men in an exciting post-apocalyptic debut." You know, I almost put this book aside after the first few chapters. The beginning is kind of slow and begins two years after the tragic events in London. There are news blurbs from the time of the disaster at the beginning of each chapter which give a bit of background about what occurred. Otherwise I felt kind of lost, looking at my surroundings wondering 'Where am I, and how did I get here?'. I'm glad I stuck around though because the story does get more interesting once the group starts their journey to London. They are all going to London to find out the truth, what the government has been covering up. There really wasn't much background on each character and I didn't really connect to them. How did they meet? Why are they friends? My favorite parts of the story involved the 'Irregulars' and the 'Superiors', people that have developed new abilities such as healing or mind-control. I wish there had been more about them and their powers. Like many first books in a series (trilogy? 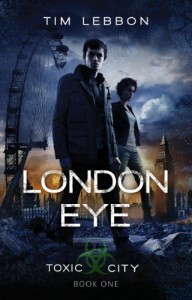 ), London Eye seems like one long set-up story that ends right as the story is really getting started. I'll be reading the sequel, Reaper's Legacy, and hoping some of my questions will be answered. *fingers crossed* I'm curious enough to want to see what happens next.